FROM GREATER CINCINNATI: Take 471 South until it ends at US Route 27. Go south for about 19 miles to the traffic light at 177 and US 27. Straight through this light and turn right just before the bridge that goes over the Licking River. Approximate travel time one-half hour. 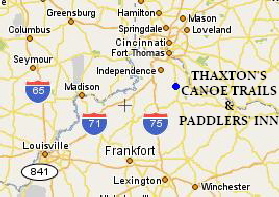 FROM LEXINGTON: Take US 27 North through Paris, Cynthiana and Falmouth. Continue north past Falmouth for 9 miles, and just after crossing the bridge over the Licking River turn left. Approximate travel time a little over an hour. FROM LOUISVILLE: Take 71 North to 75 North. Pick up 275 East. Take the US 27 -- Alexandria exit. Take US 27 South 19 miles to the traffic light at 177 and US 27. Straight through the light and turn right just before the bridge that goes over the Licking River. Approximate travel time two-and-one-half hours. From I-75 Crittenden: Take US 25 south, then make a left onto 491 heading East until it ends on Hwy 17 & 467. Stay on 467 until it meets Hwy 177. Turn right on Hwy 177 and follow it though the small town of Butler. Hwy 177 runs into a light at US 27. Make a right south on to US 27 and we are located less than two tenths of mile on the right. BE CAREFUL USING MAPQUEST!!! If you are coming from a different location, use the information above or call us and we will give you directions. 877-643-8762 or local 859-472-2000. Please use our local number from Northern Kentucky and 513 area codes.